Can the Sterling Hold at Current Levels? The GBP/USD pair is currently trading at 1.3205, close to its 52-week high of 1.34427. The sterling has enjoyed an imperious run of form in 2017, starting at around 1.23, and gaining approximately 7.3%. The US dollar index indicates an overall poor run of form by the greenback, with a year to date decline of 9.09%. Over the past 5 days (ending August 1, 2017) the DXY has shed 0.96%. During July, this broad measure of the USD’s performance against 6 currencies (JPY, CHF, GBP, CAD, SEK, and EUR) shed 3.25%. The performance of the USD mirrors the uncertainty currently felt in the US political arena. President Donald J. Trump has been battling to get anything passed in the Senate, with Republicans and Democrats digging in their heels and refusing to budge on repealing and replacing the Affordable Care Act. Meanwhile, currency traders are wasting no time pinning their hopes on an impressive sterling recovery. The GBP/EUR pair rallied on Tuesday, 1 August 2017, in the hopes of increased hawkish sentiment at the BOE. The August interest-rate decision is a big one, and pundits are anxiously awaiting Mark Carney’s statement. The MPC meeting on Thursday will wrap up August’s interest rate decision. Previously, a split vote of 5:3 in favour of retaining interest rates at the historically low 0.25% was adopted. A rate hike may not come to fruition, but sentiment of MPC members will be an important barometer of which direction the GBP will move. Experts like Montgomery Smyth believe that even if 2 of the 8 Monetary Policy Committee members vote in favour of a rate hike, the GBP/USD pair could extend its rally. For Pound bears, there is equal optimism. Inflation has retreated from the red line zone of 3%, and that is typically associated with decreased urgency to raise the Bank Rate. The dissenting voices in the MPC include Ian McCafferty and Michael Saunders, but it remains to be seen whether Andrew Haldane will vote to pull the trigger. It has been 10 years since the Bank of England raised interest rates, and most projections indicate this being an unlikely scenario. 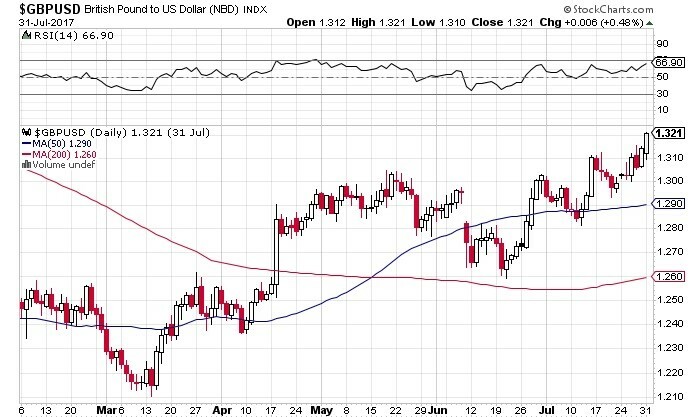 Currently, the GBP/USD pair is trading well above its 50-day moving average of 1.290, and its 200-day moving average of 1.260. Short-term bulls dominate the scene.